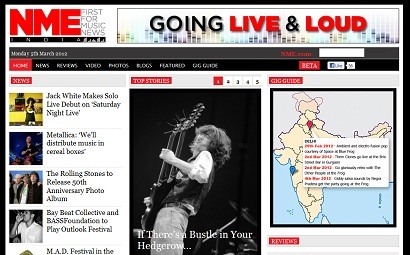 Consumer magazine publisher IPC Media has signed a partnership deal with an Indian publisher to launch a local version of NME online and in print. www.nme.in will contain content tailored to the Indian music scene and a dedicated Indian edition of the magazine will follow. This entry was posted in Journalism, Magazines, Online Journalism and tagged India, IPC Media, NME on March 5, 2012 by Paul McNally. YouTube is offering news outlets featured in Google News the opportunity to become an official partner of the site – with an aim to increase video views on both YouTube and Google News. According to a post on the Google News Blog, a partnership will offer the chance of prominent placement of a news organisation’s videos on YouTube’s news page; and, if the videos are embeddable, the opportunity to appear as a featured video on Google News. Participate in co-marketing & branded entertainment opportunities with top brand advertisers. Utilize your own sales to sell your own ads. Meanwhile, as reported by MediaWeek, Bauer and IPC Media have become two of the first magazine publishers to sell ads around their YouTube content on the site. They follow Channel 4, which struck a deal with the video-sharing site last month. Google News Blog: A Call to News Publishers: How to Share Your Video. This entry was posted in Advertising, Multimedia and tagged advertising revenue share program, Bauer, Google News, IPC Media, magazine publishers, mediaweek, Video, video sharing site, YouTube, YouTube Partner Program on July 1, 2009 by Laura Oliver. Country Life Magazine has launched a new online picture library featuring more than 100 years of images. The selection of images includes architectural and garden photography; as well as interior design images from houses across the UK and Europe. “Until now we’ve only been able to offer a limited service to researchers, but the new site allows unprecedented access to our unique record of British life over the years,” said Country Life picture library manager, Justin Hobson, in a release from publisher IPC Media. The archive is fully searchable and new images will be added each week as pictures are scanned from past editions of the magazine. It’s free to use, though registration is encouraged. Images can be ordered for a charge. This entry was posted in Magazines, Photography and tagged Country Life, Country Life Magazine, Country Life Picture Library, Europe, IPC Media, Justin Hobson, online picture library, picture library manager, United Kingdom on May 14, 2009 by Katarina Witzheller. AOL has launched a new horoscope channel under its life and style portal, Sinead Scanlon writes. The site will offer daily video horoscopes delivered by Russell Grant and forecasts for all star signs. Users will also be able to email a psychic with specific questions as part of the channel, a press release from the company said. The launch is the latest in a series of additions made by AOL this year including sports video from ESPN.com and fashion content from IPC Media on it’s UK portal. This entry was posted in Uncategorized and tagged AOL, horoscopes, IPC Media, launch, Russell Grant, Russell Grant AOL, Sinead Scanlon, style portal, United Kingdom on September 1, 2008 by Laura Oliver. IPC Media has launched a website for its fashion title Look – its first magazine site designed out of house. The new site, launched last week, offers fashion and beauty news alongside an online shopping facility. The design will aim to capitalise on the 77 per cent of the magazine’s readers, which research suggested, access the web every day, a press release from the publisher said. The site will be headed by online editor Jayne Cherrington-Cook, who has previously worked with Yahoo and AOL. This entry was posted in Magazines and tagged AOL, IPC Media, Jayne Cherrington-Cook, launch, magazine site, online editor, online shopping facility, Yahoo on June 3, 2008 by Laura Oliver.